Creativity and weed are best friends. Pair good smoke with painting, drawing, or gardening, and you’ll feel yourself epically relax, zone out, and forget all the BS. In fact, a blast of creativity plus a phatty can feel as good as a foot massage after a marathon. But what makes creative thinking and smoking the ganja feel so right? Comedian George Carlin described imbibing as “opening a window” and “broadening horizons.” Writer Aldous Huxley noticed that marijuana opens up “the doors of perception,” sparking creativity and letting it flow. Serious science says the two enhance one another because weed wakes up the same part of the brain that’s active in highly creative people. Word. 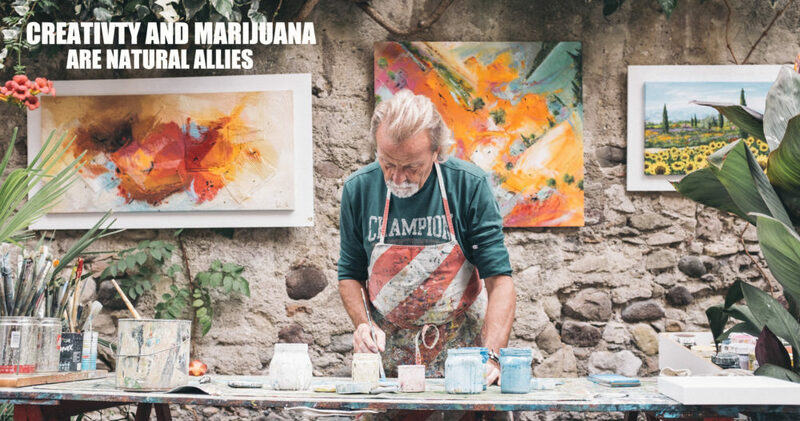 Orange County, California art studios are leading the way in the legal weed market and now offer open art classes that encourage combining a toke with a paint stroke. So grab a friend, or go alone – and explore the 420 creative scene that might open your eyes to a rad side of yourself. A Brush Tokes party is described as an easy way to meet people – everyone has something in common – and is a “judgment free” way to let your creativity loose. Included with each ticket price are a canvas, supplies, instructions, drinking water, and snacks. All you need to do is BYOC (bring your own cannabis), and you’re set. Go here for more info. This event by California Cannabis Tours offers painting sessions for stoned artists of all skill levels. They encourage the community experience of painting and puffing together. Pick up a brush and let your stress go in an inspired setting with likeminded creative types. Supplies are included, but bring your own buds and booze (oh yeah, that too). Check it out here. Dig your hands into some dirt and create a succulent garden in a plant box you get to paint. Planting is literally grounding and gets you to a chill mental place. Caring for any kind of plant opens you up to a soothing relationship with our botanical friends here on Earth. Experiencing the magic is for everyone; no green thumb required. This class includes all materials and a sampling of local weed! More info here.